Adapting to using a wheelchair or living with someone who has mobility needs can be tough, but ensuring that you have a safe wheelchair lift for home use doesn't have to be. When they're presented with the tasks of creating an accessible home and getting the right kind of care, many assume that they'll have to be limited to the first floor of their home or need to move out of the house they've called their home for years. With Nationwide Lifts, your elevator experts, that doesn't need to be the case. We offer ADA-compliant handicap lifts for homes that can be easily installed by our teams of experts. Whether you need a full enclosure or just a mobile platform, we have many different residential wheelchair lift options for you to choose from. We can help you design, choose, and implement the perfect wheelchair lift for home use. 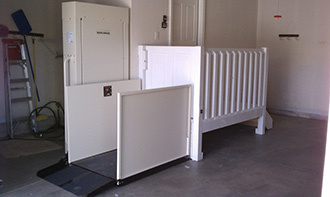 We know that a home wheelchair lift should be comfortable and convenient for you and your family, not just functional. We'll take into consideration your needs, the number and amount of steps, and the overall design of your home when trying to find a solution specifically for you. Our team can work with you to help design the best option for you and your family's daily use, whether you need a vertical lift that will fit a full wheelchair plus have enough standing room for an aide or you are considering an inclined residential wheelchair lift. For homes with multiple stories that require much larger elevator projects, we can even install full-sized elevators. We've installed many different types of mobility solutions for both residential and commercial settings and have developed a range of products that can solve many different disability needs. When buying handicap lifts for homes, there are many things to consider, such as whether it's a sustainable solution, who can install a wheelchair lift for home use, who can provide help and training, and who to turn to if it requires maintenance. We at Nationwide Lifts are the experts in elevators, lifts, dumbwaiters, and many sorts of mechanical, vertical needs. 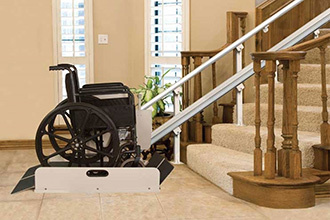 We can not only install but also repair and maintain a wheelchair lift for your house. We're one of the best companies in the business to turn to when you need a wheelchair lift for home use because we can handle all of this and provide help when our customers need it. Nationwide Lifts is an industry leader, offering a wide variety of wheelchair lifts and elevators for both home and commercial installation. Our platform lifts enable someone to board either with or without a wheelchair and ascend or descend to another level of the home. Nationwide Lifts offers a number of different home lifts, and price points may vary depending on the style and features chosen. For instance, a vertical wheelchair lift will travel up to 14 feet to assist someone with traveling up or down to different levels. Many people install this type of home lift for an outdoor application such as reaching a backyard deck or descending from it. The capacity of this type of lift is 750 pounds, and both standard and customized cabs are available. Customers can choose a completely enclosed cab or an integrated enclosure. 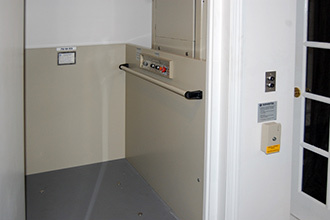 On a smaller scale, customers can also opt for a wheelchair lift that moves up and down up to six feet. 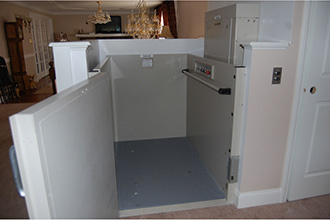 This type of home lift is ideal for assisting someone up and down outside steps so they can enter and exit a home. 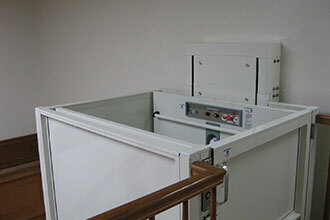 Because of the simplicity of this type of lift, an enclosed shaft is not necessary. The upper landing will need a gate with installed interlock to prevent falls. Ascending and descending takes about one minute, and the full capacity of this type of unit is 750 pounds. For homes with a straight set of stairs, a special platform can assist someone in navigation. This type of platform attaches directly to the steps and wall. The platform extends out for use when it's needed, and it folds away when you're not using it. This lift has a maximum distance of 14 feet, which takes about one minute to travel. When deciding on buying a lift for home, wheelchair lift cost considerations shouldn't be a deterrent. With our range of lift models, we're sure to have one that fits your needs and your budget. Need to take your shopping offline? Contact us online or by phone to request a free catalog that includes detailed descriptions of every model. Then, once you've narrowed down your options, see how easy it is to afford a lift for home: Price quotes are available to help you see how the home lift price will fit into your budget. If you're having a hard time deciding which wheelchair lift would be best for you, feel free to contact our representatives for advice. We'd love to help!